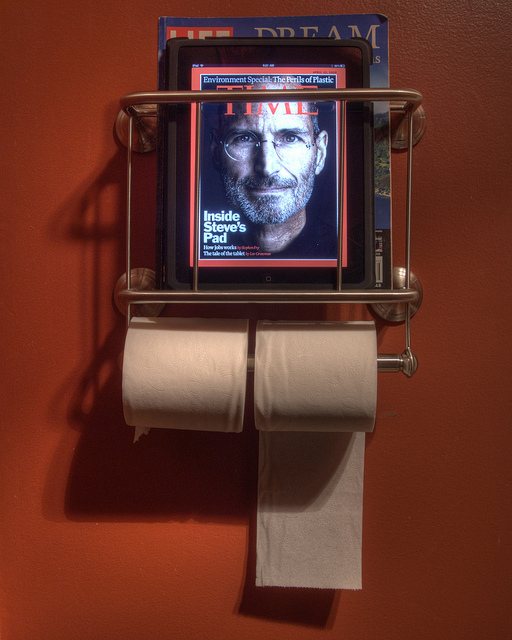 With today’s smartphones, more people are taking their work and personal lives wherever they go — even to the toilet. A new study of mobile phone habits shows 75 percent of people have texted, emailed, used apps or surfed the web while nature calls. More than 90 percent of people between 28 and 35 will return a call or text while sitting on the toilet. One in five men joined a conference call while sitting on the toilet, despite the possibility of people on the other end hearing noises or accidentally hitting the FaceTime video conferencing button. The survey by the marketing agency 11mark shows 16 percent shop while toileting. The survey indicated toilet texting was popular but its the I-Pad that gets the Job done. This entry was posted on February 2, 2012 at 8:15 am and is filed under Uncategorized. You can follow any responses to this entry through the RSS 2.0 feed. You can leave a response, or trackback from your own site.